Range of Transistor: Less than 2 (included 2) transistor which is made up of PN junction. Do not have any other resistance components in the interior. Measure the current amplification factor (B) of the bipolar transistor and the conduction voltage (Uf) of the emitter junction. Darlington transistors can be identified by high threshold voltages and high current amplification factors. The protection diode inside the bipolar transistor and MOSFET can be detected and displayed on the screen. Measure the threshold voltage and gate capacitance of the MOSFET. 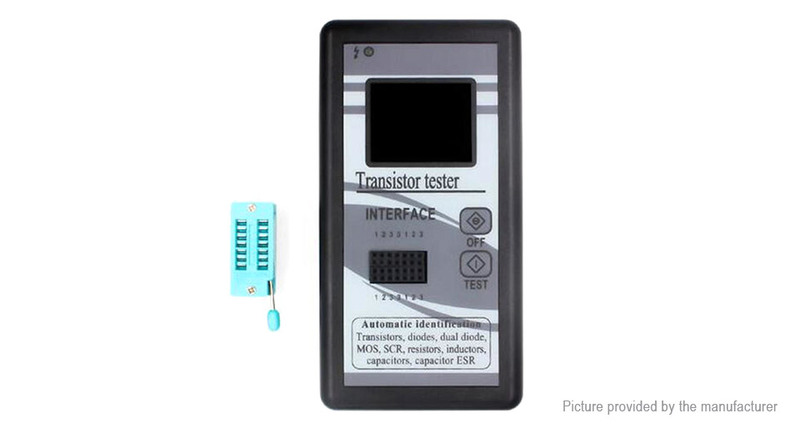 Supports the measurement of two resistances, and the potentiometer can also be measured. If the potentiometer is adjusted to one end of it, the tester cannot distinguish between the middle and end pins. The resolution of the resistance measurement is 0.1 ohm, and the highest measured value is 50M ohm. Capacitance measurement range from 25pf to 100mF (100,000UF). The resolution is up to 1 pF, and the inductance measurement range is 0.01 MH-20H. Otherwise, it will be displayed as a resistor. If the DC resistance of the inductor is higher than 2100 ohms, it will also be displayed as a resistor. In the capacitance test, the VLoss displayed on the screen is the meaning of loss and attenuation. The larger the value, the closer the capacitor is to scrapping! ESR is the impedance. The smaller the value, the better the capacitor performance! It can detect the equivalent series resistance (ESR) of capacitors above 2UF with a resolution of 0.01 ohms. This feature is very important for detecting capacitive performance. Two diodes can be displayed with the correct direction sign and the forward voltage drop is displayed. The LED is detected as a diode, and the forward voltage drop is higher than the normal value. The dual LEDs are detected as dual diodes. The LED will flash while detecting. The time for each test is about two seconds. Only large capacitance and inductance measurements take a long time.